On the 20th of November—for the 14th year in a row—Vinitaly International will return to Moscow with Vinitaly Russia, gathering Italian producers and Russian importers in the exclusive location of the Lotte Hotel in Moscow. Inaugurating also a series of events on Italian wine in Russia on the occasion of the International Week of Italian Cuisine, Italian Wine Ambassadors from the Vinitaly International Academy (VIA) will take a crucial role in teaching several master classes on Italian wines. This B2B event marks the hopeful recovery in a country still divided, on the one hand, by an exponentially growing wine culture and, on the other, by an on-going but slowly improving economic crisis. Russia has always been an important market for Italian Wine. This year in the first third quarter, according to the Italian Trade Agency, Italian wine has seen a promising recovery with an increase of +50% in volume and +54% in value. This favorable trend will be confirmed by the presence of Italian wineries gathered at Vinitaly Russia’s traditional Walk Around Tasting organized in collaboration with some of Russia’s top Italian wine importers and with event-partners Simple Wine News, Russian Cavist Association, Riedel, Norda, the Italian Embassy in Moscow and the Italian Trade Agency. On November 21st, Vinitaly International will organize for the first time an exclusive networking dinner at the prestigious restaurant Probka na Dobrolyubova (http://www.probka.org) in St. Petersburg where 8 Italian wine producers that participated in Vinitaly Russia will present their wines with the support and expertise of the VIA Italian Wine Ambassadors that will introduce the wines to Russian importers. This will be an exclusive opportunity to bridge the gap between producers and importers and bring them closer in their common aim to understand fully and thoroughly the Italian wines’ potential for the Russian markets. Following the 2 events, VIA Italian Wine Ambassadors from Russia certified by Vinitaly International Academy (VIA) will start their tour around the country spreading the gospel of Italian wine through their VIA master classes with the collaboration of the Italian Embassy of Moscow. 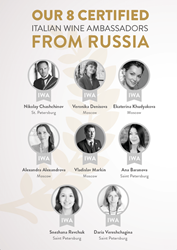 Their VIA master classes are a crucial component of Vinitaly Russia, and this is the first time they will take the opportunity to bring the event to other cities around the country apart from Moscow and St. Petersburg. The International Week of Italian Cuisine takes place under the patronage of the Italian Ministry of Foreign Affairs which is an annual event primed to celebrate Italy’s incredibly varied regional cuisine and food traditions with a wide array of events promoting culinary culture and flavours to millions of consumers worldwide. In addition to these events, Vinitaly International will act as one of the sponsors for the Bazaar Italiano, a charity event organised by the Italian Embassy of Moscow on the 25th and 26th that will benefit of scientific research on children with tumors at the Rogachev Clinic in Moscow. Vinitaly International will donate more than 200 bottles of Italian wine. Veronafiere is the leading organizer of trade shows in Italy including Vinitaly (http://www.vinitaly.com), the largest wine and spirits fair in the world. During its 51th edition Vinitaly counted more than 4,270 exhibitors on a 100,000+ square meter area and 128,000 visitors from 142 different countries with more than 30,000 top international buyers (up by 8%). The next edition of the fair will take place on 15 - 18 April 2018. The premier event to Vinitaly, OperaWine (http://www.operawine.it) “Finest Italian Wines: 100 Great Producers,” will unite international wine professionals on April 14th in the heart of Verona, offering them the unique opportunity to discover and taste the wines of the 100 Best Italian Producers, as selected by Wine Spectator. Since 1998 Vinitaly International travels to several countries such as Russia, China, USA and Hong Kong thanks to its strategic arm abroad, Vinitaly International. In February 2014 Vinitaly International launched an educational project, the Vinitaly International Academy (VIA) with the aim of divulging and broadcasting the excellence and diversity of Italian wine around the globe. VIA this year launched the third edition of its Certification Course and today counts 127 Italian Wine Ambassadors and 8 Italian Wine Experts.